We’d love your help. Let us know what’s wrong with this preview of The Girl Who Drew Butterflies by Joyce Sidman. To ask other readers questions about The Girl Who Drew Butterflies, please sign up. Does it have pincher inside of it? While each chapter heading of Joyce Sidman's The Girl Who Drew Butterflies: How Maria Marian's Art Changed Science features one of Sidman's signature (and as usual quite simply exquisite and magical) poems, I for one did not even really notice them all that much at first (simply because I was and yes remain so enchanted and delighted with and by the main narrartive, with the author's concise, readable and massively enlighteninging biography of Maria Sibylla Merian, a German artist of the latter While each chapter heading of Joyce Sidman's The Girl Who Drew Butterflies: How Maria Marian's Art Changed Science features one of Sidman's signature (and as usual quite simply exquisite and magical) poems, I for one did not even really notice them all that much at first (simply because I was and yes remain so enchanted and delighted with and by the main narrartive, with the author's concise, readable and massively enlighteninging biography of Maria Sibylla Merian, a German artist of the latter 17th and early 18th century, who is now considered by many to likely also have been one of the first entymologists and ecologists). My, what a gorgeous book. Confident, precise text, loads of direct quotes from Maria Merian, and so many of her illustrations included. It also includes small historical side-notes about different aspects of life in the 17th and 18th centuries that don't distract from the biography (or science). Sidman speculates about various parts of Maria's life that there isn't much information about, but never makes unwarranted claims, which is impressive for a book targeted at children/young adults. The de My, what a gorgeous book. Beautiful biography of 17th Century naturalist and artist Maria Merian. An outstanding work of scholarship with extensive resources cited. Wow! Just wow! I wonder if it will win a Newbery or a Caldecott. It is pretty spectacular. This is an astonishingly well crafted biography on naturalist and German artist Maria Merian. Every page is filled with her art, quotes, historic events, and each scientific stage of an emerging butterfly. While reading her story and scanning the artwork, I made the realization as to how similar they are to John Audubon's exquisite representation of birds. Needless to say, his work is inspired by Merian's. A wonderful addition to any library collection. 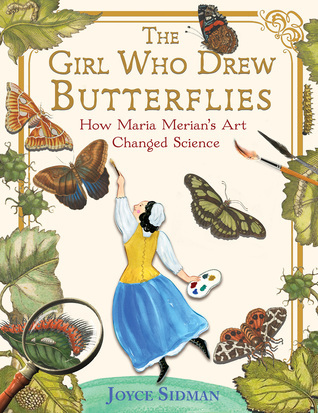 After reading Jeannine Atkins's Finding Wonders: Three Girls Who Changed Science, I was intrigued by the accomplishments of Maria Merian. I was thrilled to see that Joyce Sidman was writing an entire book on her. The result is a combination of art, science, and poetry—my favorite things. It's well researched, readable, and interesting. Joyce includes her own photographs as well as original illustrations from Maria. Each chapter begins with a poem, aptly titled "Egg" and "Hatching" and "Molting" After reading Jeannine Atkins's Finding Wonders: Three Girls Who Changed Science, I was intrigued by the accomplishments of Maria Merian. I was thrilled to see that Joyce Sidman was writing an entire book on her. The result is a combination of art, science, and poetry—my favorite things. It's well researched, readable, and interesting. Joyce includes her own photographs as well as original illustrations from Maria. Each chapter begins with a poem, aptly titled "Egg" and "Hatching" and "Molting" and such. (The entire book was wonderful, but those poems and photos are my favorite parts of the story.) In an age when the contributions of women were neither accepted nor recognized for their importance, Maria perseveres and leaves as her legacy much about the true order of insects, destroying long-held myths as she documents their origins. The glossary, author's note, timeline, quote sources, and bibliography make this a must for every classroom and library, K to 12. Oh my. Sidman does it again. What a talent. Gorgeous book illustrations and designs. engaging text, powerful biography, rich and accurate technology and science, fascinating history, end-matter, and a poem. In a way I love the poem the most, how we read one verse at the beginning of each chapter, and how it's about a butterfly but is also a metaphor for a life of anyone, especially for Maria. I'm just blown away by all the different things we learned. The processes of engraving and printing. The Oh my. Sidman does it again. What a talent. Gorgeous book illustrations and designs. engaging text, powerful biography, rich and accurate technology and science, fascinating history, end-matter, and a poem. In a way I love the poem the most, how we read one verse at the beginning of each chapter, and how it's about a butterfly but is also a metaphor for a life of anyone, especially for Maria. I'm just blown away by all the different things we learned. The processes of engraving and printing. The sugarcane and slavery of Surinam. The community of the Labadists. The development of science from its roots w/ Aristotle, through superstition, through catalogs of extensive but casual observations, to the beginnings of actual focused careful observation and experimentation. Such a joy to read & view, and such a satisfying learning experience. I love Joyce Sidman's books and I adored this one. What a treat to discover Maria Merian's accomplishment! What a marvel! And how marvelous to read this and be in awe of the beauty and wonder of the natural world. It really is astounding. This is a perfect text for students like the ones I taught when I was at a Reggio-Emilia school as the school librarian as this book encourages direct observation of something in order to learn about it. This one is definitely deserving of all the awards! Maria Merian lived a fascinating life: an artist, scientist, wife, mother, religious seeker, entrepreneur, explorer, writer, observer, and all-around amazing person who never stopped pushing the boundaries of what was possible. This book elegantly tells the story of her life in a tidily assembled collection of narrative, rich illustrations, quotes from Merian, and contextual sidebars that never interrupt the flow of the story. 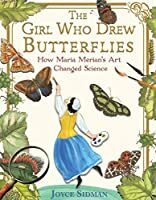 There has been a push of late to draw attention to un- or under-known Maria Merian lived a fascinating life: an artist, scientist, wife, mother, religious seeker, entrepreneur, explorer, writer, observer, and all-around amazing person who never stopped pushing the boundaries of what was possible. This book elegantly tells the story of her life in a tidily assembled collection of narrative, rich illustrations, quotes from Merian, and contextual sidebars that never interrupt the flow of the story. “Her intrepid fieldwork and careful observation helped uncover the truth about metamorphosis and changed the course of science forever." This beautiful book about Maria and her accomplishments begins with an insect glossary - such a great idea to put a glossary in the front! It is helpful to know at the outset, for example, the differences between moths and butterflies. There are informational pictures with captions as well, like one demonstrating the parts of a copper engraver’s workshop, similar to that owned by Maria's father. The book concludes with an Author’s Note, a Timeline, and a Selected Bibliography. Recommended age range is Age 10 - 12 years. A visually stunning book. I loved the illustrations and images of original works of Maria’s art. I also love that it was more than a biography. It had history lessons and science lessons as well and all beautifully presented throughout the story of Maria Merian’s life. An explosion of talent, curiosity, and the scientific method. More than a century before Darwin and The Beagle set out Merian traveled to a land distant and rich in experience and bugs. Wow! What an undertaking, Ms. Sidman! Congratulations! A fascinating and beautiful biography of an amazing woman who really brought art and science together--in the 17th Century!!! Amazing book. Breathtaking illustrations. Meticulous research. A work of art to be poured over! Loved the poem and photo of the caterpillars that Sidman raised while writing this book that head each chapter. Very comprehensive biography of one of my all-time heroes. This is a great upper elementary book. Wonderful book. I'm glad to have learned of Maria Merian. This is a nonfiction book about a very early naturalist and artist. What's different is that this one started her career as an amateur and a young woman. Remarkable for the 1600's. And she helped in a big way dispel the notion of Spontaneous Generation. On a side note - and the book doesn't mention this at all - her father who died when she was three is quite a bit more famous than she ever was. He drew maps and etchings of very many Europ Wonderful book. I'm glad to have learned of Maria Merian. This is a nonfiction book about a very early naturalist and artist. What's different is that this one started her career as an amateur and a young woman. Remarkable for the 1600's. And she helped in a big way dispel the notion of Spontaneous Generation. This book is an amazing gorgeous blend of biography, science and art. What a beautifully produced and written book. My only issue is with the title but that’s a quibble. Seriously, bravo to Houghton Mifflin for what is really as much an art book as a biography. Joyce Sidman has done an outstanding job of bringing Maria Merian’s work to light! Excellent text with beautiful illustrations! I really learned so much. 🦋romantic love was considered "temporary insanity"
First of all, this is just a stunningly beautiful book. The illustrations and plates are wonderful throughout the entire book. And, as is the case in a well-written children's book, I learned so much, not only about the subject of the biography, but about the world in which she lived. I am definitely putting this book on my wish list - I want my own copy! This is an exceptional biography about a female scientist from the 1600s. At a time when women were accused of witchcraft if they showed an interest in "unworthy" creatures, Maria Merian's fascination with butterflies and caterpillars helped advance science. Her paintings of the life cycles of butterflies and moths helped people understand that butterflies and caterpillars are the same species and it helped document their living conditions in the wild. In her time, people actually thought that i This is an exceptional biography about a female scientist from the 1600s. At a time when women were accused of witchcraft if they showed an interest in "unworthy" creatures, Maria Merian's fascination with butterflies and caterpillars helped advance science. Her paintings of the life cycles of butterflies and moths helped people understand that butterflies and caterpillars are the same species and it helped document their living conditions in the wild. In her time, people actually thought that insects just SPONTANEOUSLY APPEARED. Structured in stages similar to a butterfly's stages, this biography tells of a strong woman who was hindered by circumstance but still made a significant contribution to science. A beautifully produced biography. From the illustrations, to the well-selected quotes, to the perfectly placed sidebars and text features, to Sidman's own poetry and clever chapter headings. Just a gorgeous book through and through, and well-researched too. I especially loved the way Sidman mirrored Maria's life to the life span of the very creatures she studied. Rather brilliant. A perfect book for young girls with an interest in science.